We prepare you for your flight attendant interviews with Qatar, Etihad, Emirates, British Airways, Singapore Airlines and all international airlines. We coach you to be more confident, give you tips on how to answer difficult and tricky questions, role play, provide you feedback on how you perform and how to improve. We also coach you on what to say and more importantly what not to say. What happens when you get invited to the Assessment Day? - Group discussions. Team working is an important part of being a cabin crew, so the group discussion can help your recruiters see how you relate to one another when you work as a team. They will give you a topic to discuss and your recruiters will observe and make notes about you. - Role Plays. This involves you playing a role with your recruiters. This will give them an idea of how you are likely to handle certain situations and challenges that may arise in your role. - Ability tests, likely to include numerical reasoning or getting you to play out different scenarios. These take the form of psychometric tests. What happens at the Final interview? At Emirates, Etihad and Qatar, you are more than likely to be given a Behavioural interview than a Biological interview. At a Behavioural interview, you will be asked to provide examples of specific work situations you have been in. You need to tell your recruiters how you handled it and what the outcome was. Please think of some examples before your final interview. Please rehearse your answers before the final interview. If you require one-on-one interview coaching, get in touch with us. Alex came to us for guidance on her application photos, CV preparation and our one-on-one interview, and she passed at first attempt! She is currently cabin crew with Emirates Airline. Eilyn came to us for guidance on her application photos, CV preparation and our one-on-one interview, and she passed at first attempt! She is currently cabin crew with Emirates Airline. Lauren came to us for guidance on her application photos, CV preparation and our one-on-one interview, and she passed at first attempt! She is currently cabin crew with Emirates Airline. Dave at Studio Images UK speaks to Jess Cairney (above) to establish what inspires her imagination to be an Emirates cabin crew. 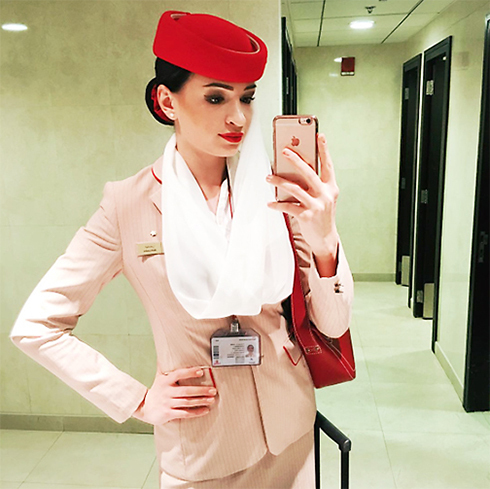 "What inspired me most about Emirates Airline or flying in general is how beautiful all flight attendants are. It's a job where you have to show empathy, understand your passengers and take good care of them. Seeing cabin crew when I was younger made me want to be like them one day. Of course travelling the whole world is one of the most common inspirations. Today I am in Dusseldorf, in a few days I'll be in Chennai." I asked Jess what her top 3 destinations were. She replied "With Emirates flying to so many interesting destinations, it would be difficult to decide on my three top layovers. I would say the first of all is Japan. I love the people. the food, the fact that the Japanese hold on to their culture so confidently really inspires me. Secondly, may be New York, as I have an obsession with Broadway. There is something magical about Broadway that just lightens my day. And, lastly, I think Seoul. I just love Asian countries in general, and would choose Asia over Europe any day. Korea for me is simply beautiful and the food is incredible, and it snowed when I was last there." What would you say to Emirates wannabes who are trying hard to secure this dream job? Jess replied "For those of you wannabes who are inspired to be EK cabin crew members, I know this would sound so cliche but honestly be yourself guys. It's not a hard dream to achieve. It's all about being personal and kind. If you are able to convince the recruiters just that then there is no reason why they wouldn't hire you. I would of course say that you should make an effort to dress and present yourself well, and would emphasise on this. If you don't make it first time, please don't be discouraged. It just means that you are going to be that much better at the next attempt. Good luck to you all." Finally, Jess says to all wannabes "To get your photos and CV looking extra special for your application, please check out Studio Images UK. Dave is amazing and hopefully one day you can join me and many other cabin crew who explore this world one bit at a time." Emirates, Etihad and Qatar cabin crew coaching and tutorials. Interview questions asked.